*Zondervan provided me with a free copy of this book for reviewing purposes. The Super Heroes Bible in 3D is a phenomenal option for the little men in your life. Boys spend much of their youth looking for people/figures to look up to and act like, and who better than some of the biblical "super heroes"? This is a Children's Bible that has much appeal to get the young men in your life interested and excited to read the Bible. When this was delivered, my son was all over it - He thought it was super-cool! He even brought it to school, and who knows if that is even allowed these days? The 3D aspect of it truly gives this Children's Bible a very competitive edge. Additionally, there are special feature sections (authored by Jean Syswerda) which spotlight important biblical figures, emphasizing their strengths and explaining why, as a moral person, you should strive to be like them. 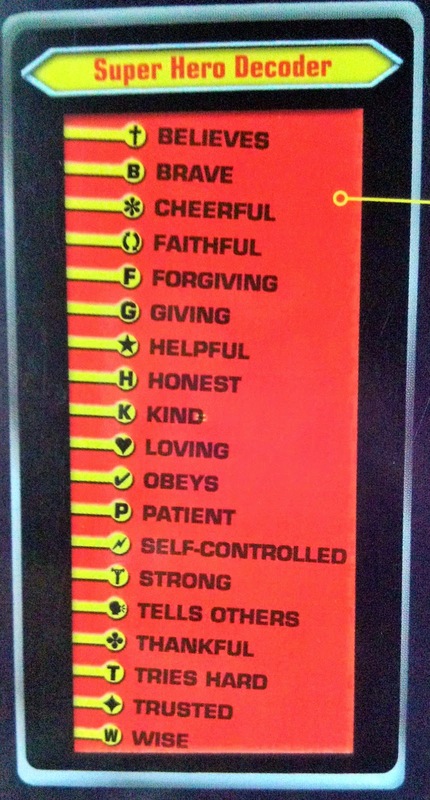 On top of that there is even a special Super Hero Decoder that allows kids to relate different symbols (i.e. ♥ = Loving, † =Believes, ♦=Trusted, ★= Helpful - Check out the second picture in this post for the entire list) to these people they are introduced to throughout the Bible. This is also the New International Reader's Version (NIrV) Bible, and is very simple to read and comprehend making it a superior choice for children. I'm a fan of The Super Heroes Bible in 3D because my son is so crazy about it. I know that it was the 3D capabilities that drew him in, but sometimes he needs a little persuasion and something that grabs his attention in order to hold his interest. I personally would choose this Bible over my own because it makes the often complicated and confusing jargon in the Bible, well.....elementary. It uses basic language that is easily understood. I feel that the added features in this Children's Bible make it that much more engaging and comprehensible. As a Children's Bible, I appreciate the hardcover and durability that it provides. The only thing missing is waterproof pages! The illustrations, by Denis Jones, are great, and the 40 full-color 3D pages scattered throughout are absolutely amazing! Disclosure: I received this item for free in exchange for an honest review. The opinions stated here are my own.